We are excited to announce that our 5th Annual Pop Tab Pandemonium (PTP) contest will open on September 1st, 2016! 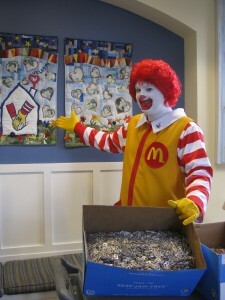 The PTP program raises valuable funds and awareness for Ronald McDonald House Charities of Alabama. Money is raised through the recycling of the tabs which contributes to our annual budget required to offer the services provided by our House. All schools in Alabama are invited to register and encourage their students to collect pop tabs during the 2016-2017 school year with a goal of collecting the highest number of pounds of tabs per student enrolled. The deadline to REGISTER your school is March 31st, 2017. The contest will end on April 28th, 2017 and 5:00 pm is the deadline to drop off your tabs. All registered schools must drop their tabs off at RMHCA in order for the tabs to be counted towards their school’s total and MUST coordinate their drop off time with our Pop Tab Coordinator (Pop.Tabs@rmhca.org, 205-638-7260). The overall winning school will receive a school assembly with Ronald McDonald (upon availability), possession of the traveling trophy for 1 year, recognition on RMHCA’s website, and additional prizes (upon availability). Have questions? Contact Pop.Tabs@rmhca.org, 205-638-7260.